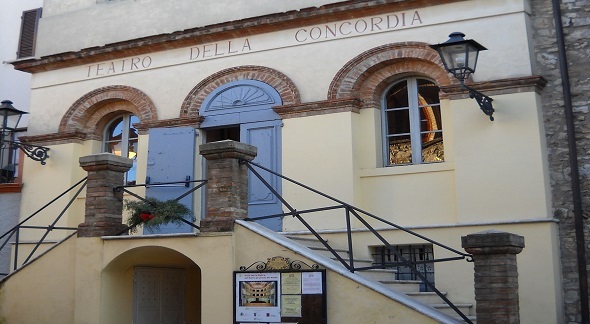 The Theatre of Concordia in Monte Castello di Vibio is known as the smallest theatre of the world: it is, in fact, the smallest Italian style theatre and one of the smallest historical theatres. This little and precious place, that offers 99 seats between parterre and daises, is a perfect miniature reproduction of the great Italian and European theatres. It proposes their form, structure and acustic. Because of these characteristics, it is different from the other ordinary theatres of little size. Theatre is open to guests and has a various schedule of shows and guided tours. 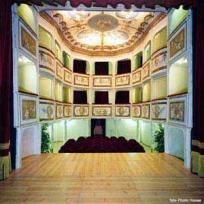 The Theatre of Concordia was built at the end of 1700, when the territory was under the Napoleonic occupation. It was inaugurated in 1808 and they called it "of Concordia (harmony)" to underline the values of equality and brotherhood: the inspiration camw from the atmosphere of "people harmony" spreaded after the French Revolution all around Europe. The structure of the theatre proposed again the italian theatres of Goldoni style, whose it is the only real architectural proof. 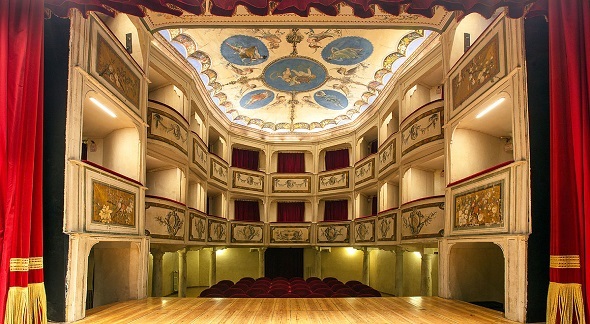 The theatre has 3 elements considered fundamental ones by Goldoni: wood daises, a bell map, plafone built by a camorcanna technique. In addiction, the Theatre has many precious and artistic details. The interior rooms and all the ambiances was enriched by materials of quality and by many frescoes, carefully painted by Cesare Agnetti and his young son, the painter Luigi Agretti. After a period of decline, culminated in a closure in 1951, the administration decided to restore it. They have been worked on it for 7 years to take back the theatre to its ancient wonderful aspect. The Theatre of Concordia has a rich programme of events and shows. 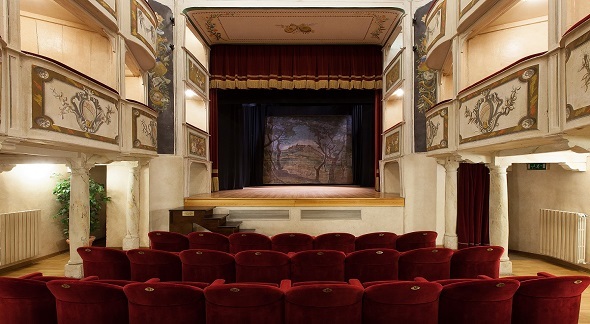 The Theatre proposes the seasonal performances of "Teatro Stabile dell'Umbria" and every year it organizes some performances especially dedicated to the youngest ones, called "Teatro Ragazzi" and realized in collaboration with "Fontemaggiore" Innovation Theatre. Then there are many activities linked to the cinema: movies, cineforum, meetings. For extra openings, in particular in January, February and March, it is possible to ask at the Tourisme Office located behind the Theatre.